Dr. Matthew Spangler, center right in gray, and Dr. David Kahn, center left in white, lead participants of a 2014 summer institute, “The Immigrant Experience in California through Literature and Theatre” through a performance exercise. The pair will host the program this summer with a National Endowment for the Humanities grant. Matthew Spangler, a professor of communication studies in the College of Social Sciences, and David Kahn, a professor and chair of the Department of TV, Radio, Film and Theatre in the College of Humanities and the Arts, will be leading a summer institute for K-12 teachers and graduate students at San Jose State in July, with a grant from the National Endowment for the Humanities (NEH). 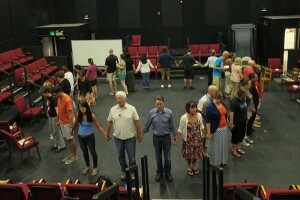 “The Immigrant Experience in California through Literature and Theatre” will bring 25 teachers and graduate students working toward a career in K-12 teaching to SJSU where they will interact with professors from a multitude of disciplines as well as artists and authors who have explored the immigrant experience in their works. The teachers will explore the written pieces through performance activities and will perform a piece of their own creation by the end of the program. “The institute combines immigration and performance, and that’s what I do with my scholarship,” said Spangler, who wrote Staging Intercultural Ireland: New Plays and Practitioner Perspectives (co-edited with Charlotte McIvor, Cork University Press, 2014). 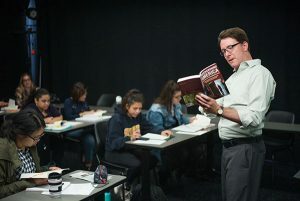 “The Immigrant Experience in California through Literature and Theatre” was offered at SJSU in 2014 through an NEH grant, with 150 teachers applying for the available slots. Guest faculty include Maxine Hong Kingston (author of The Woman Warrior) and Andrew Lam (author of Perfume Dreams: Reflections on the Vietnamese Diaspora), playwright and SJSU alumnus Luis Valdez, ’64 English (author of Zoot Suit and founder of El Teatro Campesino), and theatre artist Ping Chong (author of East West Quartet and creator of “Undesirable Elements” performance series). The program will discuss immigration in an historical context with curriculum around emigration from Mexico, China, Afghanistan and Vietnam to California. Other SJSU faculty members who are involved in the summer institute include Glen Gendzel, an associate professor of history, and Persis Karim, an associate professor of English. Spangler, who studied at Trinity College in Dublin and completed a dissertation on Irish author James Joyce, said he became interested in the influence of immigration on Irish arts when there was an influx of movement into the country between 1995 to 2008. In addition to his scholarship, Spangler has also adapted books for the stage, including Khaled Hosseini’s Kite Runner and T.C. Boyle’s Tortilla Curtain. Read more about “The Immigrant Experience in California through Literature and Theatre” online. Matthew Spangler, a professor of Performance and Communications Studies, and David Kahn, a professor and chair of TV, Radio, Film, & Theatre, received a grant for $168,000 from the National Endowment for the Humanities. The grant will allow Spangler and Kahn to put on a two-week summer institute for 25 school teachers that will explore the immigrant experience in California through literary works and theatrical adaptations. Previous institute faculty included Luis Valdez, playwright and author of “Zoot Suit,” Maxine Hong Kingston, author of “Woman Warrior,” and many others. The institute explores ways in which the immigrant experience to the United States, and California, in particular, has been represented through literary texts. the topics include: (1) the construction of political borders between geographic territories and social borders between groups of people; (2) intercultural interaction between settled and immigrant communities; (3) changing family and gender dynamics within discrete immigrant communities. Participants will explore these topics as they pertain to emigration from Mexico, China, Vietnam, and Afghanistan. 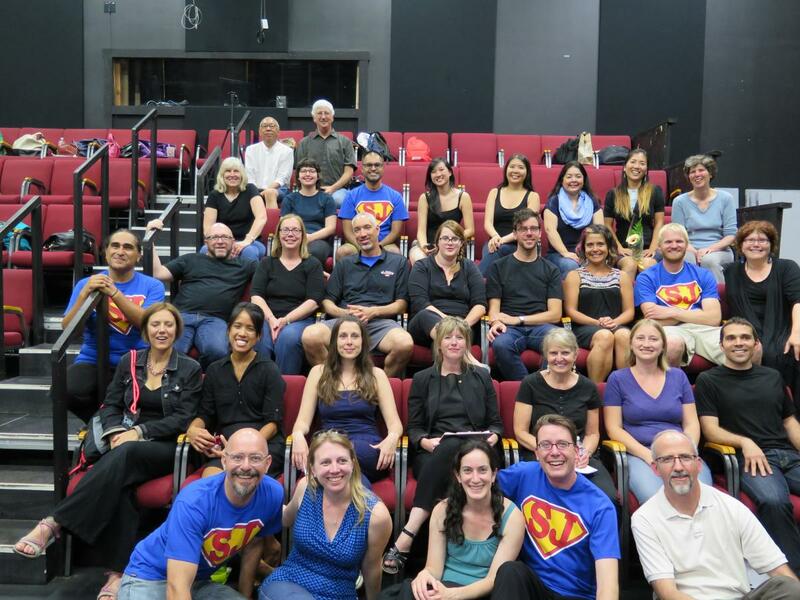 Scholars from the 2014 “The California Immigrant Experience through Literature and Theatre” program pose for a photo. Entitled “The California Immigrant Experience through Literature and Theatre,” the institute will be held July 17-31, 2016. Applications are available online for qualifying K-12 teachers. For more information, visit the Immigration Theatre Institute website.